A COLD front and associated low pressure system produced moderate falls in southern Western Australia and southwest South Australia early in the week, while a low pressure system and trough produced moderate falls in parts of southern Queensland and eastern New South Wales. The highest weekly total was 95 mm at Warrie Station in southern Queensland. Past seven days: At the start of the week, a complex low pressure system over the Tasman Sea brought mainly light falls to eastern Victoria and Tasmania. In the west, a cold front and associated low pressure system produced a cloudband that tracked along the southern coast of Western Australia, bringing moderate falls. As the low pressure system tracked eastwards along the southern coastline, the associated cold front and cloudband moved over South Australia, generating moderate falls across southern South Australia west of the Yorke Pennisula. Light falls were reported in parts of the State’s agricultural districts. 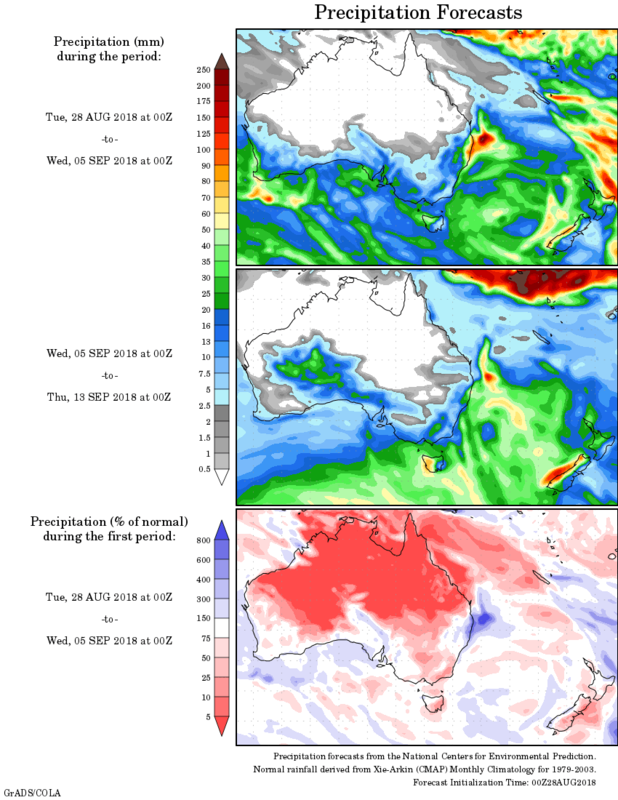 By the middle of the week, an upper level low entered far southwestern Queensland, and combined with a deepening surface trough that stretched through inland Queensland and New South Wales. Showers and thunderstorms produced moderate falls over southern Queensland, and parts of northern and central New South Wales. The complex area of low pressure extending through southern Queensland and western New South Wales moved slowly east. Moderate falls were generated along the east coast and adjacent inland districts of southeast Queensland and New South Wales, easing as the system moved offshore late in the week. At the end of the week, a cold front followed by a cold southwesterly flow over Tasmania produced moderate falls in southwestern Tasmania and light falls in parts of southern Victoria. In the west, a trough followed by a cold front and associated low pressure system moved across southwest Western Australia, producing moderate rainfall along the southwest coast. Rainfall totals exceeding 50 mm were recorded in small parts of western Tasmania, northeastern New South Wales, and inland southeastern Queensland. Rainfall totals between 25 mm and 50 mm were recorded in areas of Western Australia’s far the southwest corner and the Esperance coast, around Ceduna in southwest South Australia, an area of western Tasmania, and in southeastern Queensland and northeastern New South Wales. Rainfall totals between 10 mm and 25 mm were recorded along the southwest and southern coast in Western Australia, southwestern South Australia and the State’s Northwest Agricultural District, western Tasmania, northeastern and eastern Victoria, parts of central and eastern New South Wales, and surrounding higher falls in southeastern Queensland. Little or no rainfall was recorded in remaining parts of Western Australia, the Northern Territory, northern and eastern South Australia, western and northern Victoria, northeastern Tasmania, western New South Wales, and western and northern Queensland.